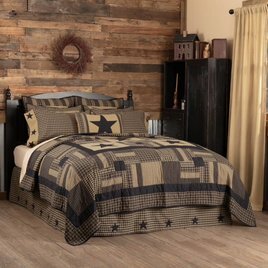 The Annie Buffalo Check Black Luxury King Quilt is a modern farmhouse look that pays homage to classic country themes through double diamond hand-quilting, buffalo checks, & fresh color. 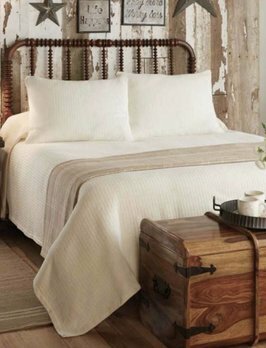 100% cotton batting, reverses to solid antique white. Cozy and refreshing the Hatteras Seersucker Blue Ticking Stripe Quilt Coverlet Set gives off a cool ocean breeze, vintage vibe. 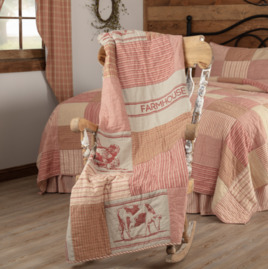 Featuring popular ticking stripes in light farmhouse colors with quality seersucker material to enjoy for years to come. 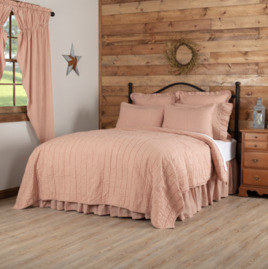 The Sawyer Mill Ticking Stripe Coverlet brings farmhouse style to life. 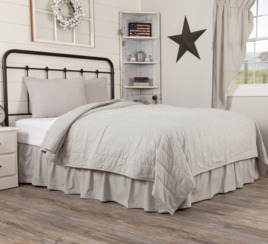 This coverlet's popular ticking stripes is the perfect piece to brighten up your space and give it a fresh, up-to-date farmhouse look. Reverses to solid color - cotton.